Oak Point is a 55+ community in Middleborough, Massachusetts. This active adult neighborhood offers great low-maintenance homes available on a new and resale basis. Residents of the community enjoy a long list of amenities and activities geared to keep them socially and physically active. 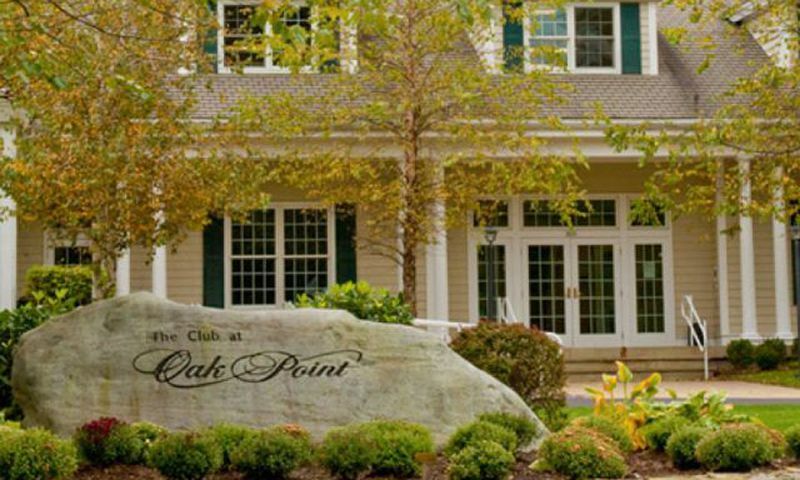 Ideally situated outside of Boston, Oak Point is located in a quiet area with easy access to big city attractions. Oak Point offers great amenities to all of its residents. Inside the clubhouse there is a myriad of choices for homeowners. Those looking to stay fit can work out in the fitness center, swim a few laps at the indoor pool, or join a workout class in the gymnasium. If you are looking for a more socially charged lifestyle you can join neighbors and friends for a game of pool in the billiards room, play some cards in the game room, or attend one of the many community parties in the ballroom. There is also a library where you can relax and read the paper or choose from one of the many great titles offered. The amenities continue outside with two outdoor pools, a spacious patio, two tennis courts, two bocce ball courts and two shuffleboard courts. There are also walking trails that wind throughout the community, offering a great way to get outside and stay in shape. Residents can also use the picnic and BBQ area for hosting parties with neighbors during the warm summer months. Started in 1999 by Hometown America Communities, Oak Point currently offers single-family homes available on a new and resale basis. Plans are calling for 1000 homes once the community is completed. Homebuyers have four models to choose from ranging from 1,200 to over 2,000 square feet of living space with two to three bedrooms, two bathrooms, and an attached one or two-car garage. These homes offer great features such as gourmet kitchens and low-maintenance exteriors. If you are looking for a different design than what is currently offered the builders will work with you to construct the home of your dreams. Residents of Oak Point enjoy an excellent low-maintenance lifestyle. An annual homeowners' association fee covers general maintenance of the community grounds and amenities as well as lawn care and snow removal during the winter months. This allows residents the opportunity to forget about the tedious chores of owning a home and lets them focus on enjoying hobbies while exploring new ones with family and friends. Those looking to mingle with neighbors can do so at one of the many clubs and activities offered in the community such as arts and crafts, billiards, yoga, book club, potlucks, water aerobics, dance club and bingo. Oak Point is located in Middleborough, Massachusetts, just one hour outside of Boston. This 55+ community is surrounded by endless opportunities for shopping, dining, and entertainment. During the summer months residents enjoy many of the recreational opportunities in the area such as golfing at one of the many courses or taking day trips to the nearby beaches of Cape Cod. The outdoor activities continue throughout the winter months with cross country and downhill skiing opportunities. Close proximity to I-495 offers an easy way to travel to other parts of Massachusetts as well as Rhode Island and Connecticut. Massachusetts' active adults looking for a great 55+ community should look no further than Oak Point in Plymouth County, MA. There are plenty of activities available in Oak Point. Here is a sample of some of the clubs, activities and classes offered here. Homebuyers have four models to choose from ranging from 1,530 to 1,855 square feet of living space with two or three bedrooms, two bathrooms, and an attached one or two-car garage. These homes offer great features such as gourmet kitchens and low-maintenance exteriors. I have lived here for two years and have not been sorry one day. I love living here! We moved into a home here at Oak Point in September, 2017. My wife and I both love being here. There is as much or as little activity as you want to enjoy. The facilities are absolutely wonderful. The folks that man the office in the clubhouse are friendly and very helpful whenever they can be. We have very much enjoyed watching our lawn being cut and our front walk and driveway being cleared without us lifting a hand. It has been a marvelous time living here. 55places.com is not affiliated with the developer(s) or homeowners association of Oak Point. The information you submit is distributed to a 55places.com Partner Agent, who is a licensed real estate agent. The information regarding Oak Point has not been verified or approved by the developer or homeowners association. Please verify all information prior to purchasing. 55places.com is not responsible for any errors regarding the information displayed on this website.